In the liturgical calendar, these are always special days of grace: the period when the church prepared to "go out into the whole world." "Lord, send out your Spirit, and renew the face of the earth!" The words of today's Responsorial Psalm are a prayer which rises up from the heart of the Church in every time and place. They remind us that the Holy Spirit has been poured out as the first fruits of a new creation, "new heavens and a new earth" in which God's peace will reign and the human family will be reconciled in justice and love. We have heard Saint Paul tell us that all creation is even now "groaning" in expectation of that true freedom which is God's gift to his children, a freedom which enables us to live in conformity to his will. As we give thanks for past blessings, and look to the challenges of the future, let us implore from God the grace of a new Pentecost for the Church in America. May tongues of fire, combining burning love of God and neighbor with zeal for the spread of Christ’s Kingdom, descend on all present! Almost four years after John Paul II invited the first Cenacle's heirs in this land to undertake "an authentic self-renewal," in our own time and with even greater urgency Peter came among us to make louder his call for a new "birth from above" on these shores, that there might come among us "a new youthfulness and a new springtime" -- indeed, nothing short of a "new Pentecost." Clearly, this call is no mere slogan or flashy, empty rhetorical device. Clearly, having come emphatically over two pontificates watching closely from afar, this call is not going away anytime soon; if anything, it will only get louder the longer it goes unheeded. Clearly, this call isn't one to continue the complacency of division, the despair of arrogance, ignorance or the "false sense of security" that is more of the same, but to something different and better -- to a new boldness of commitment, candor and cooperation, to a replenished identity, vitality and unity, to genuine examination and purification both internal and institutional, to true, joyful assent and obedience to the teaching of Christ, delivered by no less a messenger than His Vicar on Earth. For us who believe, after all, this call wasn't merely his... but His. The only question that remains lies before each of us, its answer only found when, one by one, we find it in ourselves to take this call seriously... when we put aside whatever obstacles we've placed in its path... when, at long last, we allow ourselves to listen, to respond and, so, to rise to it. Nobody ever said it was easy... but if you're thinking "no time like the present," well, you might just be onto something. 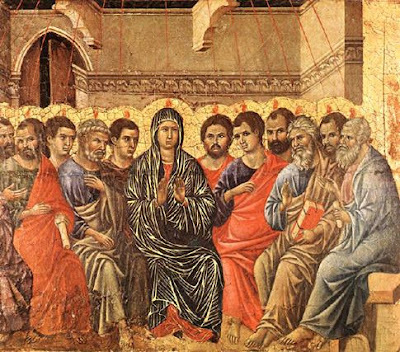 The nine days between Ascension and Pentecost are, of course, the period to which we owe the practice of novenas. Yet of the many that've become commonplace over the years, the original seems to get woefully short shrift. To remedy that, underscoring the importance of this time and what it foreshadows -- both in the days behind and those ahead -- the ConcordPastor has given his pages over to the Pentecost Novena... that, having been called anew to seek and receive it, the church (that is, all of us, gathered again "in one place together") might be open to the Spirit who burns to renew the face of the earth -- of this earth.